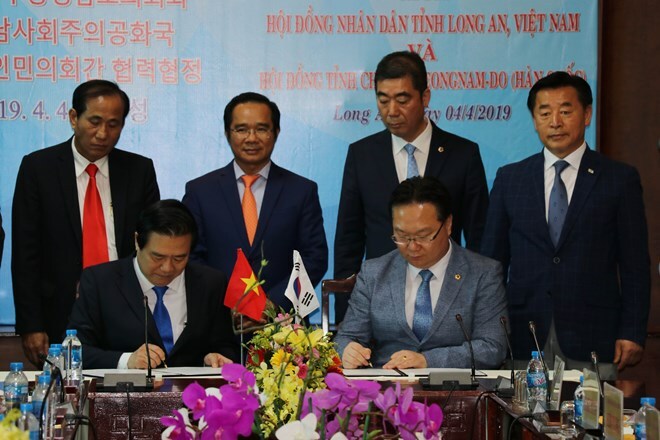 Long An (VNA) – The Mekong Delta province of Long An and the Republic of Korea (RoK)’s Chungcheongnam-do will enhance socio-economic collaboration under an agreement inked between leaders of both sides in the Vietnamese locality on April 4. Accordingly, the two provinces have set up collaborative ties on the basis on mutual respect, benefits and equality. They will work to promote mutual understanding amongst local people; boost experience sharing; and foster cooperation across the fields of economy, culture, science-technology, education, tourism, and environmental protection, among others. Hosting a reception for the RoK’s delegation, Secretary of the provincial Party Committee and Chairman of the provincial People’s Council Pham Van Ranh asked for Chungcheongnam-do’s support in Korean language training for local officials, firefighting and rescue vehicles, development of public administration and e-government, and high-quality human resources training. Ranh also introduced the province’s potential in agriculture, industry, trade, and services to his guest, saying that the province expects to welcome RoK investment in these fields. Yoo Byung Kook, Chairman of the RoK province’s council, said that he respected the sound relations between the two localities. He expressed his hope that following his visit to Long An province, businesses of both sides will have more chances to cooperate in trade and investment.